Those are the Lord of the Rings heroes we all know but probably never had seen them like this before. 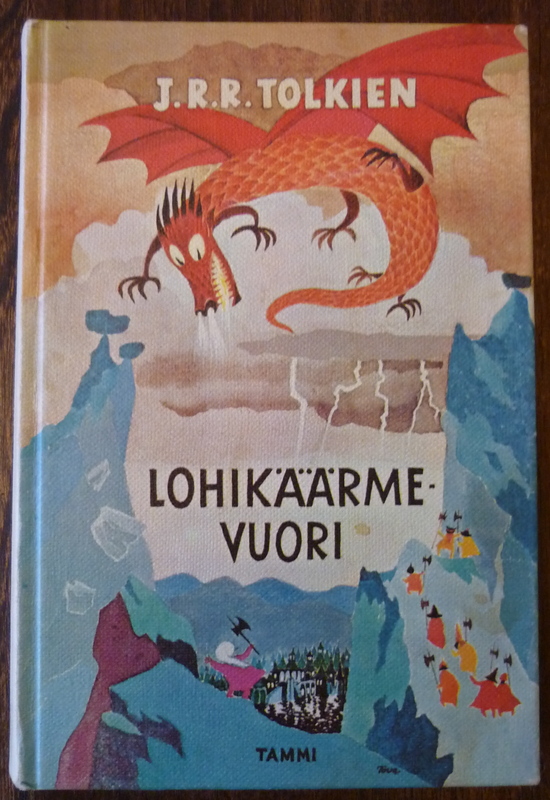 In Soviet Russia they had that book too, it was not a full trilogy but illustrations were made by a local artist and look very different from the ones there were in the Western World. Can you guess all of the characters depicted here? The hint, the one on the cover is Bilbo. They have a Russian map! They say that later, nowadays, when they wanted to publish a new edition of the Lord of the Rings in Russian they asked one of the notable illustrators to make new sketches to go with the book but he refused telling them: “I can’t beat the class of that old Soviet artist whose works were so enchanting to any Soviet kid”. And there is the question again – can you tell who is who in those? The world didn’t need a first Lord of the Rings, so why this? This is not Lord of the Rings, is The Hobbit. so BS this and learn russian. The Hobbit is the very well known book by Tolkien that later led to the writing of the spin-off sequel Lord of the ring books. Everyone that have read LOTR have also read The Hobbit. It is being filmed by Peter Jackson/Guillermo del Toro right now and will be released in 2012+2013 (two parts). I’m sorry to nitpick, but that is The Hobbit, not The Lord of the Rings. Also, the character’s name is Bilbo (Bilbao being a city in Portugal). The illustrations are cool though, thanks for sharing them! Bilbao is a Basque city located in Spain. Thanks for the nice pictures, cool post! I just wanted to add to the conversation that Bilbao is not in Portugal, but in Spain, in the Basque Country. I would buy that edition, even untranslated, just for the illustrations. Wonderful. Thank you! I’m seriously grossed out by the feet (I HATE!!!!! feet!) but otherwise, I love love love these illustrations! I love the faces, and I love that dragon. The artist who drew these is a genius! They have tons of cool Russian stories equivalent to many famous pieces. I had such one in my early youth! Someone M. Belomlinsky as printed on the second cover page. anyone know where I can buy the movie or book in Russian? these are awesome! By the way, it was not a “low-budget movie” but a teleplay – most of it shot on theater-like stage with static decorations. Judging by the actors and technical details it was probably shot in mid-80’s. Nice, I was read this book (this exact edition) when I was really young, I read it myself later and I still have this book on my shelf now. According to the book The Annotated Hobbit, this Russian edition was published in 1976. The illustrator was Mikhail Belomlinskiy, who graduated from the I.E.Repin Institute for Painting, Sculpture and Architecture in 1960. He became known as a political cartoonist as well as a prolific children’s illustrator. He later moved to the USA. I don’t see anything funny on this book. In childhood i have this book, and know you what? I like it! Please, don’t show old russian books as monstrous. Yes, probably pictures in book seems little odd, but it was a long time ago. Did you understand the article and comments? No one is making fun of this book or calling it monstrous. They are admiring and praising it! I would buy a copy of this if it were available today and I don’t even know enough Russian to read it. And I wish I could watch the whole movie. Continue to study English and then come back and read this post again and you’ll see that this is a very positive post, not mockery. My comment is for topic starter. I was think that he giggling on it. I see it on 2leep with title “Lord of the Rings like you never see it before” or something like that, can’t remember exactly. Now that’s priceless! Very interesting post. I wish there was also an englishbrasil.com and englishchina.com, we would see a lot of interesting stuff too. And the book is the classical 1976 Russian edition of the Hobbit widely acknowledged as best in Russia. Just the one that I have. 😛 Translated by Natalia Rakhmanova and illustrated by Mikhail Belomlinsky. In Russian, but I can translate if needed. Exquisite illustrations, done with talent and heart. Awesome illustrations, this is a lost artform! @ Chris Wininger: Of course they translated Lord of the Rings as well – first translation was published in 1976, in fact. Soviet szudents were singing A Elbereth Gilthoniel as enthusiastically as American ones. Bilbo’s furry feet are absolutely charming. Like so many, I read The Hobbit to my children. They loved it, especially my portrayal of the lisping Gollum. I later tried reading them The Lord of the Rings, but it did not have the same attraction. Much later they read The Hobbit to their children, immitating my version of Gollum. Don’t know if they went on to Lord of the Rings. I love the drawings! Glum is done exactly the way i imagined him. As a kid i loved soviet cartoons and like them even now. The television films and other material from eastern europe demonstrates one thing – unlike the lavish spending in the west, our artists aimed and always could get a lot of bang for as little buck as possible. Awesome. Great blog, lots of info. Thanks for sharing!